In Peterson's 'Land of Shining Water' novels, you can't help but draw comparisons to Romeo and Juliet. However, with not only one, but two pairs of star-crossed lovers, the level of intrigue is definitely heightened. There is plenty of drama and excitement to keep fans engaged and flipping to the next page. When Chantel Panetta's younger sister claims to be in love with Orlando Calarco, Chantel knows there is no hope. The Panettas and Calarcos have been sworn enemies for decades, and young love cannot heal the deep wounds between the two iron-mining families. Yet, unable to resist Isabella's pleas, Chantel agrees to help her sister spend time with Orlando...only to have a run-in with Dante, Orlando's brother. Chantel can't deny the attraction that flares when she's with Dante. But when a tragedy occurs at the mine, is there any hope that the hatred that has simmered between these two families might be resolved? Or will Chantel and Isabella's hope for love be buried amidst decades of misunderstanding? 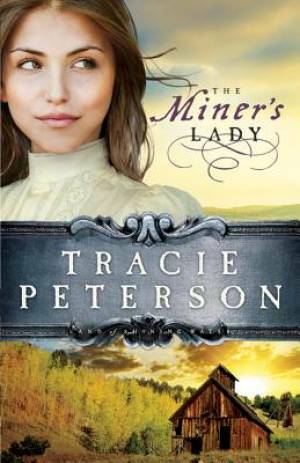 The Miner's Lady by Tracie Peterson was published by Baker in October 2013 and is our 46061st best seller. The ISBN for The Miner's Lady is 9780764206214. Fans will be eager to read the next installment in the frontier series. Reviewed by Library Journal Review, 15/09. Romeo and Juliet were tame compared with the fireworks surrounding the families of Dante Calarco and Chantel Panetta. Their respective younger siblings, Orlando and Isabella, are in love, and Isabella asks Chantel to distract Dante so she can spend time with Orlando, a distraction that leads to a second case of star-crossed lovers in the family. Meanwhile, their fathers are determined to carry on the feud they brought with them from Italy to Minnesota, until an accident at the mine where they work changes Papa Panetta?s mind and he feels God is leading him to make peace. Unfortunately, the elder Calarco is determined to see the Panettas dead?and his son with them if he leaves the family. VERDICT Peterson delivers another solid historical romance, and fans will be eager to read the next installment in her frontier series (The Ice Cutter?s Daughter; The Quarryman?s Bride). Got a question? No problem! Just click here to ask us about The Miner's Lady. Tracie Peterson is the award-winning author of over ninety novels, both historical and contemporary. Her avid research resonates in her stories, as seen in her bestselling Heirs of Montana and Alaskan Quest series.